Ask fellow campers about "Goulding's Lodge & Campground" and nearby attractions. It's all about location here. You have wonderful views. Mostly pull throughs, gravel sites with FHU 30/50 amp, cable, wifi is good, 3G Verizon. The sites are close but I don't feel crowded. There are cabins, tent sites. My only complaint is that we had to park the truck perpendicular to the site. There's a lodge with restaurants, grocery stores. Tours & other places to visit close by. Would return. We camped at Goulding's Lodge & Campground in a Fifth Wheel. Tour - Mexican Hat is close by. The good about the location - it is away from the highway and has a partial view of the valley. The bad - it is next to a water station for the area residents to come bring their large tanks to fill (often with a diesel truck). We were in Row 1, Site 15 and it was very tight for our unit. We had to disconnect the truck and angle it carefully into the spot. We were very close to neighbors, to the point we asked one of them to heat with propane instead of their heat pump the next night. Also, some of the neighborhood dogs and cats roam the CG. The staff obviously works hard to clean the restrooms, but the management needs to spend a little to update the hardware - things were old and clean. We camped at Goulding's Lodge & Campground in a Travel Trailer. We stayed here so we could take their early morning tour which will pick you up right at the campground. This is really the only game in town. There are other campgrounds where you rent a patch of dirt with a great view. 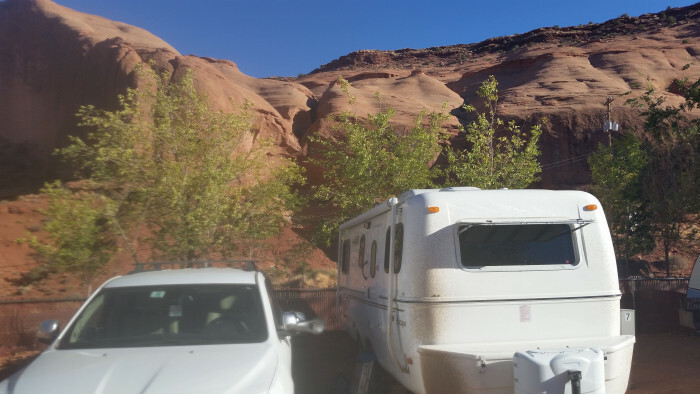 We had full hookups, a level site and good wifi surrounded by big red rocks and with a view of the mittens. Roads are paved and it's clean considering it's surrounded by red dirt. This is our 2nd time here. We've taken tours through Goulding's twice since we can leave our dogs in the RV with the AC running and just walk to the store to pick up the tour. We camped at Goulding's Lodge & Campground in a Motorhome. Campground was very dusty with red dirt everywhere. It could definitely use more gravel. Lots of the sites were not level. We were lucky and got one where we could level the coach. We stayed a week, probably about 4 days to many. Restaurant belonging to the campground was the worst experience we have had at a restaurant in recent years. Scenery is beautiful. We were in site 22. Verizon phone service with 2 bars but no internet. T-Mobile phone service but no internet. We camped at Goulding's Lodge & Campground in a Motorhome. Best place to eat is at "The View" Restaurant in Monument Valley. Admission is $20 per car for up to four people and the pass is good for four days. 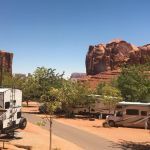 There aren't a lot of choices for RV parks in Monument Valley. 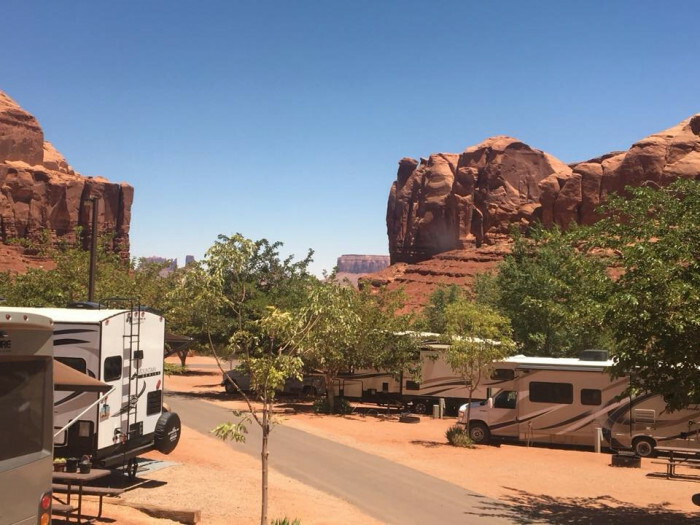 Goulding's has a long history in Monument Valley with an extensive collection of facilities: lodge, restaurant, gift shop, grocery, gas station, casitas and the RV park. The park is in a lovely location, however, it is on a fairly steep hill. It seems that when an RV park is located on a steep grade they almost never get the site pads level. That's the case here. Getting level is a bit challenging. The driveways are asphalt and the site pads are gravel and dirt. We had a pull-thru with full hookups, 50 amp electric, a picnic table, fire pit and a nice view. There is a cable TV connection but we didn't use it and there's free WiFi but we found it to be suboptimal. We were not able to get Verizon 4G data service here. 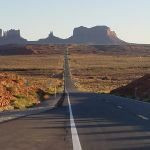 If you are interested in a tour of Monument Valley, Goulding's has tours that pick up at the campground. We heard from others that their pricing is quite good compared to other options. We took the early morning Deluxe tour and enjoyed it. We paid $56.83 per night with Good Sam discount. We camped at Goulding's Lodge & Campground in a Motorhome. Big rigs be aware that not all sites are level. Our site was not level, very narrow with tree limbs that had to be cut before we could pull in. Car will likely be out in the road a little at a 15 degree angle. They made no effort to match the rig to the site. Some big sites had small popups or even tents. Trees need to be trimmed in every site. We had to use boards under the tires and jacks. Ask for a big site if you are 40 feet long. I would not stay here again. We camped at Goulding's Lodge & Campground in a Motorhome. We booked a small back-in site but didn't know how small it really was. We backed in to the site fine but discovered no room to put our Jeep. They suggested their parking lot. We moved the picnic table to the very back of the site and parked in front of it. It was a tight fit. If we visit again, we will get a pull through site. We camped at Goulding's Lodge & Campground in a Travel Trailer. The Deluxe Tour was great and worth the price. The location alone is uniquely Monument Valley. 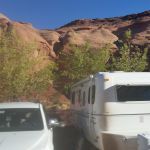 Cannot get a lot closer and park your RV with full hook-ups and the very extensive amenities associated with the lodge. This is our 4th time and there surely will be a 5th time and more. There is a pool (never used), showers, etc. close to the sites. All previous sites gave excellent views of Monument Valley but this site only offered views of the next RV. Urge you to ask for end of row away from office (close to campground), alternatively the top row in order to get fabulous views. There are free John Wayne movies at the lodge, their restaurant has delicious Navajo Tacos (order the small - the regular will feed a family of 4). Views are simply fantastic. One of my favorite places on earth! We camped at Goulding's Lodge & Campground in a Motorhome. 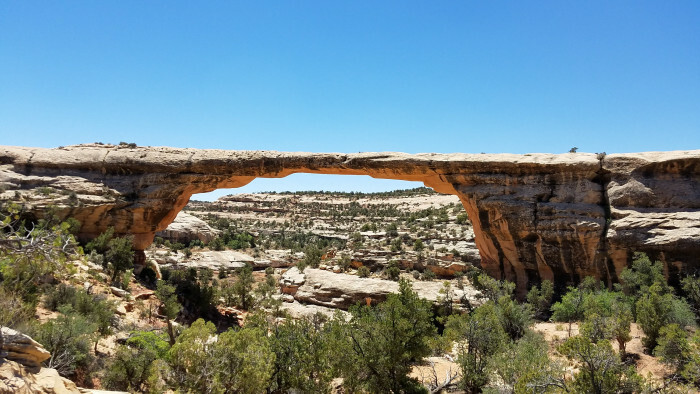 Be sure you take the very expensive all day tour ($140 incl lunch) through Mystery and Monument Valleys - an unforgettable experience especially if your Navajo guide/driver is as good as all of ours have been (done this tour 3 times and learn/see many new things each time). Spend the few dollars and visit the new hotel at the drive entrance to Monument Valley. Went to Gouldings for the full hookup. Managed to flood the sewer system which gave some nasty smell on our and neighbours sites. This was fixed the next day and we got relocated to another site, so follow-up of management was adequate. 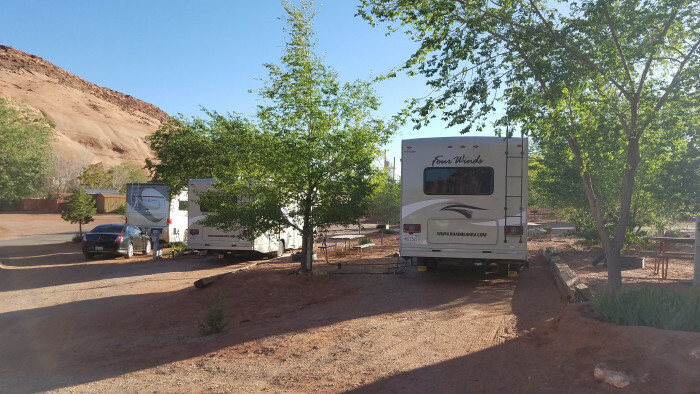 While visiting Monument Valley (which you need to unhook for because there is no shuttle going from Gouldings to the park entrance) we spotted some campers near the park entrance as well. Seemed they had a good place with great view, no hookup though. Good facilities (big grocery shop and tank station near the campground entrance) make it a good place to stay for a day or two while visiting the NP. Swimming pool is indoor, simple but nice! We camped at Goulding's Lodge & Campground in a Motorhome. Horseback riding in Monument Valley is a must do! And don't forget to make a photo at Forrest Gump point. Gouldings is gigantic. Not just the CG, but it is an entire resort complex with a lodge, motel, restaurant, store, gas station and tours into the Valley. There is a free shuttle bus to move you from the CG to the other areas. The Cg is built on a hill, area is basically red sand and sites have a bit of gravel to steady them. Blocking will be required. My spot had some shade, but most trees are immature. Well wwatered. WiFi worked fine. No delay. Check-in was efficient, the crew helpful. Beautiful surroundings. We camped at Goulding's Lodge & Campground in a Motorhome. There are several tours into the Valley, but Gouldings also offers sever themselves. Convenient because they pick you up at the CG and deliver you afterwards. Restaurant is pricey but good. Nice park with small swimming pool. Is a Monument Valley destination location so make reservations if you can, and yes expect to pay top dollar. We used their web site to make reservations but it was awkward and our second night reservation was lost, and they made it right by shuffling others around. Roads are paved, sites gravel, lots of smaller trees that need to be cut back to avoid scratching sides/top of RV. Sites are gravel, mostly NOT all that level but we were able to level. Sites not long enough to keep toad or pickup truck connected but can nestle in beside/front/rear however works best. Good electric, roof satellite was able to get past trees and over rock formations, good Verizon cellular. It was fun to park among the beautiful rocks. Very convenient to Monument Valley. Good place to pick up tours to park. Lodge has places to eat, shop, fuel, etc. We camped at Goulding's Lodge & Campground in a Motorhome. The view is very nice with the park located in a red rock canyon. The site required leveling blocks and is gravel+dirt. We paid for the big rig premium site and it was just long enough that the truck+30ft 5th wheel would fit when hooked up. Disconnecting required that the truck to be parked to the side. Wifi had spotty reception and the power voltage ran in the low end. The sewer connection is at the rear of the site and I could only reach it by backing the trailer so the end stuck out into the roadway. We camped at Goulding's Lodge & Campground in a Fifth Wheel. Go to the Golding's lodge to buy your souvenirs. Visit "John Wayne's" house - it was the filming location for his character in She Wore a Yellow Ribbon. There is also a free (donation) museum at the lodge that has film memorabilia. 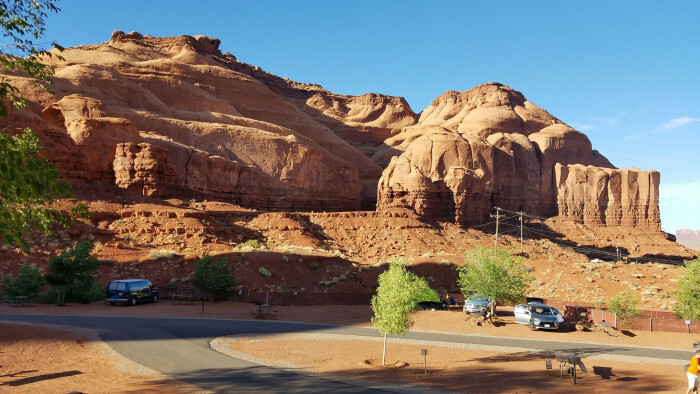 The park is in a canyon with red cliffs all around you which give a nice setting. Store with a souvenir shop and some supplies. Laundry and showers in the same building. You can also book a tour out of the store. We camped at Goulding's Lodge & Campground in a Fifth Wheel. Only stayed one night enroute east, but we really enjoyed the campground. Our pull-through was long enough to stay hooked up and was quite level. It's out of the way, but has lots of amenities. The pull-through are very close together, but we had no problem getting in and out. We camped at Goulding's Lodge & Campground in a Travel Trailer. 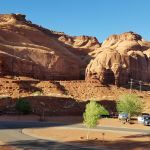 We stayed at Goulding's RV Park in Monument Valley, Utah, and could not have been more pleased. The park is kept up very well. There is a small convenience store located in the park. The showers and restrooms are very clean and well maintained. We had an issue with a leak in the main water hose in our RV and maintenance was very helpful in trying to get it fixed for us. He was very patient and helpful. 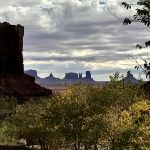 This is a great place to use as a base camp to see Monument Valley Tribal Park and also Natural Bridges National Monument among many others. We will definitely stay here again!! We camped at Goulding's Lodge & Campground in a Motorhome. The roads are all one way, so its a good idea to scout out your site by foot or disco your tow before you go in so you know what to expect. Watch out for the trees overhanging the roads and encroaching on sites, especially if you have slides. Monument Valley Tribal Park has good views but the road is very rough. Nice drive to Goosenecks State Park, through Mexican Hat, passes where Forrest Gump stopped running. Get you souvenirs at the gift shop at Gouldings Lodge. The prices are way better and they have more of a selection. Sign up for one of the many guided tours. Many to choose from, but I recommend the half-day tour if you have limited time. Everything you see is one breath-taking view after another! The restaurant on the property is good. Goulding's is famous because Harry Goulding convinced John Ford to make movies here. John Wayne's cabin from "Stagecoach" is part of the museum, as well as a "movie room". Every night a full-length feature of one of the John Wayne movies is shown. This place is AMAZING! The View hotel/food spot is good to sit and have a small taco or stew while admiring your first glimpse of the valley. Worth a stop. 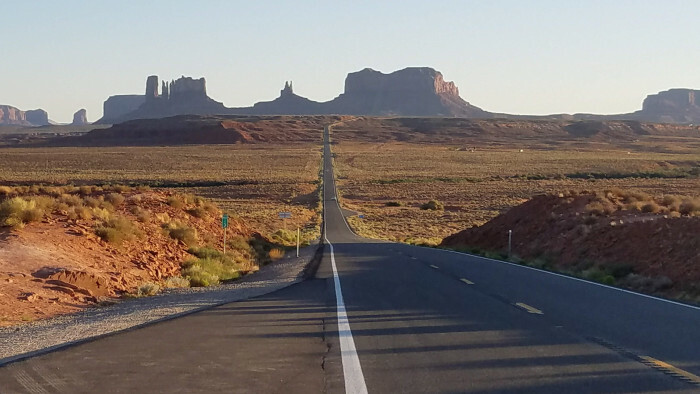 The monument valley road is very very tired. Lots of pot holes so no one goes fast. A half day or whole day to see the area - not a large amount of hiking so the long 17 mile drive is worth the time. John Ford's Point is the best view in the place. Do not miss that even if u drive in to that point and do not continue. 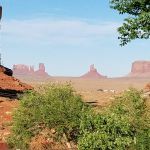 Treat yourself to a Navajo lead horseback tour at sunrise - one of the most memorable experiences of a lifetime (and I grew up in the Southwest). Monument Valley Navajo Tribal Park is a beautifull place to visit, but the gravel roads needed serious maintenance work at the time of our visit. You have to pay an entrance fee to get into the park. This is Navajo land so National Park service passes aren't valid. The 17 mile drive is worth it. Neat stuff to do locally, John Wayne movie (as it pertains to surroundings), local culture and geological info. 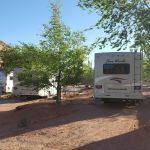 When staying in the campground our main goal was to do the self-guided driving tour of Monument Valley. It was very convenient to the park and the visitor's center which also had a nice store. Gouldings has a nice hotel and restaurant nearby. They have a museum, visitors center, gift shop at their lodge and there is shuttle service. This establishment has been here since the beginning and was the focal point of many John Ford westerns. Monument Valley is one of those places that can be called "eye candy!" The Navajo Nation Tribal Park is worth the time it takes to drive through (maybe about 3-4 hours). No RVs, but if your vehicle has some ground clearance, like a pickup or SUV, then no need to spend the money for one of the "guided tours." Restaurant on site not half bad, had breakfast which was good and generous portions. Go to Monument Valley at sunset, gorgeous! If you like to hike Wildcat Trail is a nice one. Review the tours and choose wisely. You can see everything on a self guided tour and get the map from the entrance personnel. Take the Mounument Valley tour (75.00). It was a great experience. Also drive up to Gooseneck State Park for spectacular views. If you are thinking about booking a tour of Monument Valley, consider a private one. You will get more bang for your buck and travel in an air conditioned or heated vehicle. 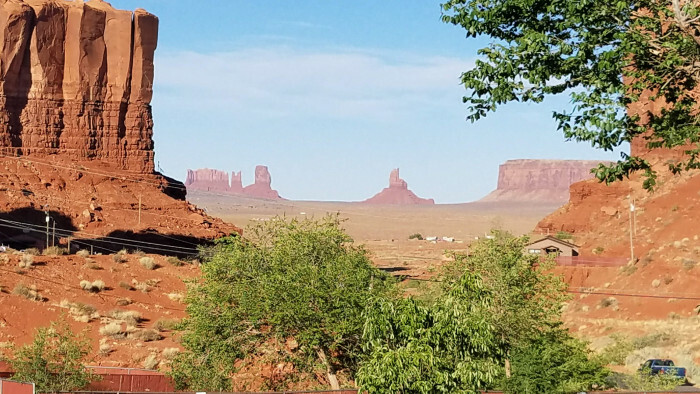 Check out Monument Valley...if you don't wanna pay for guided tours, you can pay about a $25 entrance fee to the Navajo Nation Tribal Park and drive your own self-guided tour. See Monument Valley. It's not something that I would crave a repeat of but as a one time visit, it's good. See the museum at Gouldings. Interesting to see all the movies that have been filmed here. It's Monument Valley which is stunning. Recommend if you do not have a hearty vehicle, you do go on a tour. The road through the park is very bad and would be difficult for a smaller car to navigate. We have a large truck. The Gouldings grocery store on site was very convenient and carried all needs. Food at the restaurant on site was very good and very reasonably priced for the oversize portions. Go to the Navajo tribal gift shop for the best prices...we got 50% Off! Take morning tours if in summer. Goulding RV Park & Hotel offers a number of tours. We highly recommend taking the all-day tour. It takes you to places tourists would not see any other way. It was incredible! But be prepared for rough, bumpy roads and a lot of dust! Ask for Carol if she's available; she was an amazing tour guide! If you like adult beverages, make sure you are well stocked before going here. We took the 3 1/2 hour Gouldings tour of Monument Valley. Kind of expensive for what you get. The road is very rough but doable if you do not mind the wear and tear on your vehicle. We drove the Valley Trail in Monument Valley in our 2014 Ford Edge with very little difficulty. There were some rough spots especially in the 1st half mile but we never did scrape bottom but came close a few times. Not a good ride if you have a low clearance vehicle. Drive your tow vehicle through the valley, entrance fee $20 and good for a few days. VERY rough road but most cars can get through if you're careful but no RV's allowed. Make a reservation, they fill up all the time. Even with levelers it might be helpful to have a few blocks, our site was just barely able to make level but they're not all like that. Many tour companies in area, do some research before coming. Watch time zones. Grocery, car wash, restaurant on property not within walking distance. Gas station for gassers. Watch speed bumps. Ask for site 45 if you want a beautiful view of the valley! Make sure to take the tour of Monument Valley and use the Dineh tour. They allow you to bring your dog and no extra charge. 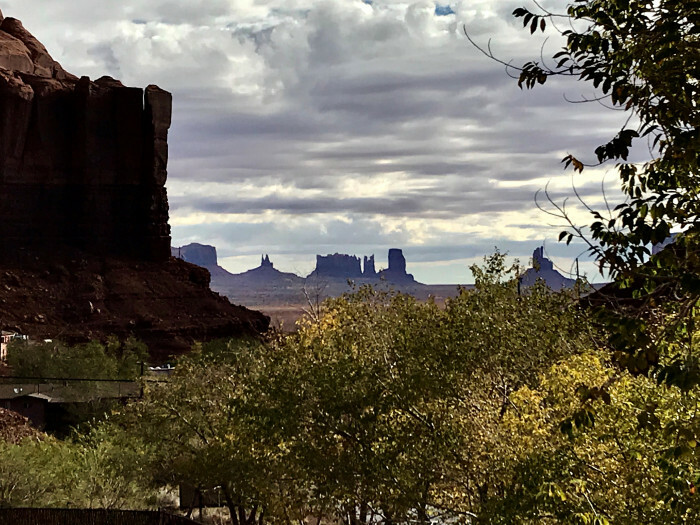 Take one of the tours of Monument Valley that Goulding's has to offer. A lot of interesting things to see including petroglyphs, Navajo hogans and all kinds of rock formations. They have movie programs that include John Wayne movies filmed in Monument Valley. Monument valley was great, we also did a self guided tour of Valley of the Gods located about 20 miles north just after the "Mexican Hat" We actually enjoyed it more than monument valley. 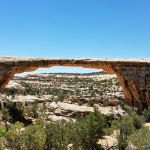 Fun drive up the Moki Dugway to Natural Bridges National Monument. Worth the trip. Valley of the Gods very nice as well. Not much to Goosenecks State Park. $5.00 for a nice view of the San Juan River. Fort Bluff on the way north to Arches NP very interesting. The reason to stay here is the visit to Monument Valley. Your pass will be good for two days. Be sure to take the guided tour. You will be taken to back country sites were unguided people can not go. Our eight person tour was great. We used "Safari tours" and I highly recommend them. Our guide was Toney, who gave great insight into both the Anasazi and the current Dene people. The Monument Valley bus/jeep tours are very dusty. Bring old clothing to wear if you intend to do that. Lots of people had dust masks. You can also do a self-guided tour in your own car, which we did. Anything with a decent clearance (we have a Subaru) will be fine. The Navajo Nation Visitor Center has all the tour info. Shop for groceries in Page or some other city, there are no places to buy food in the area other than Gouldings, which is limited. There are many, many tour companies offering tours of Monument Valley. Goulding's tours are convenient, but usually very crowded. We opted to go with a local Navajo owned company instead that meets inside the park. Note that admittance to the Monument is for two days per vehicle ($20 at this writing), and is run by the Navajo's, not the State for Federal government, so there are no discounts. Not sure if you need to call the day you are arriving to ensure that your reservation still stands. The campground uses an on-line reservation system. If it is broken, I hope they fix it. They did provide unit parking at no charge when we visited monument valley the next day. Very busy place lots of overnighters. Rest rooms clean, but again very busy. Call to get reservations or you might not get a spot for the night! Lots to see, but there is a fee for everything! Visit Monument Valley. Disconnect your tow vehicle upon arrival before going to your site, it'll make it easier to park. Your tow vehicle may not be on the same level as your RV. There was a fee of $ 20 per person to enter the park. We stayed on the main road and still enjoyed the scenery. Be sure to take one of the guided tours, it will be the highlight of the trip. If you go to see The View across the street from Gouldings, the cost is $20 for up to five people and is good for two days. Several Indians were selling jewelry along the highway, jewelry is alot cheaper in price here than in Arizona. Explore the Monument Valley. We took a tour. Well worth the money. You're on the Navajo Reservation so take the time to learn about the local culture. If you're a John Wayne fan, you've come to the right place. Take the half day monument tour! Well worth it! Chili and fry bread are delicious. Good breakfast in restaurant. I took the 3 hour tour on the valley that was offered by Gouldings and picks up at the campground. Basically it was seats and a rough frame welded on a flatbed truck. It was extremely bumpy and being flung around hurt my back. It is still really painful. I should have sat closer to front or see what vehicles other tours used. Overall, I highly recommend some sort of tour because much of the area inside the valley is off-limits to non-Navajo vehicles. It can cost over $100 per person for the guided tours of Monument Valley. But for $20 entrance fee you can make the seventeen mile loop drive in your own car and see almost everything the tours see. Do NOT MISS Valley of the Gods, a beautiful scenic drive very similar to Monument Valley, without the crowds. It is BLM land and FREE!. Drive 40 minutes of so north on Hwy 163, about ten miles north of Mexican Hat to Forest Road 242. Valley of the Gods info is easy to find in a Google search. Had a couple of great tours with Gouldings. What an amazing place! You won't want to stay here too long. Of course, tour Monument Valley. Do your grocery shopping before you get here as there are no markets; just one convenience store. Be sure to take one of the tours through the valley. The resorts restaurant is OK, but the Navajo taco is great. Order the small one. Just a heads up this area has no alcoholic beverages at all so bring your own with you. Make sure to try the Navajo Taco at the restaurant. Meals in Goulding's Lodge are good & plentiful, and many feature Navajo fry bread and other local specialties. The John Wayne movies at the lodge are fun; you can take a shuttle there from the campground, or drive yourself. Nice little museum there too, based on the Gouldings who started the place, and on the movies filmed in the valley. No Verizon cell service here; roaming only. We kind of enjoyed being "off the grid" for a few days, in that respect. Monument Valley is about 4 miles away. Motor homes are not allowed in the valley due to the rugged road. If you are in a motor home you can leave it there and take the shuttle tour of Monument Valley right from Gouldings. We were able to change our tour time from Friday morning to Thursday afternoon. Glad we did because we avoided the rain. Our second day there we went through the museum which was excellent. Horseback riding in park. Go to stable located near three sister monument when in park. About 15 minute ride after entering park. Took one of the offered tours of Monument Valley and weren't disappointed. Enjoyed local fry bread dishes at the restaurant and went into hock procuring a Navajo rug at the trading post/gift shop - definitely worth it though! A shuttle runs from the campground to the restaurant/trading post/gift shop in the evenings. Don't miss the opportunity! Self driven tour of Monument Valley $20 one car, or various tours $56 - $70 per person from a couple hours to all day (with meal) in open pickup truck/bus tour type vehicles. Take sunglasses, water bottle and jacket as conditions change fast. Are you affiliated with Goulding's Lodge & Campground ?